Artist Sergei Ivanov was never indifferent to the tragic events that are associated with the history of the Russians. Ivanov expressed his involvement in the experiences of the plight of the people through his own works in painting. Shortly before his death, the artist creates one of his latest works, called Baskaki. The author never tried to embellish the Russian life or to depict only grandiose accomplishments and conquests. Therefore, in the picture he created the truthful image of ancient Russia, ordinary, with all its hardships, oppressing the inhabitants of this great country. 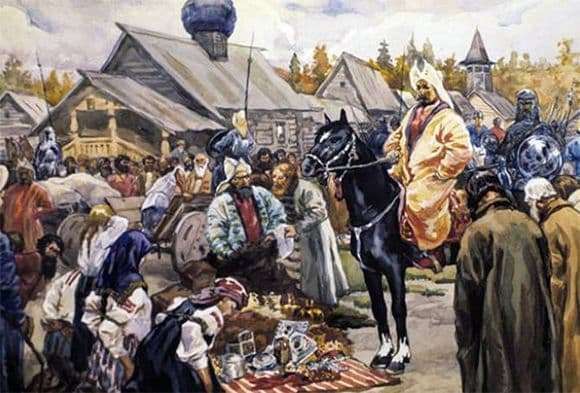 In the picture, the viewer sees how Russian people are forced to pay tribute to the cruel wars of the Tatar-Mongol yoke. Let the Russians fall under the slavery of the Horde, but their lifestyle, as well as their original and enduring disposition, will not be crushed. The main protagonist of the canvas is Bask, sitting on his black horse. With a haughty expression on his face, he examines a valuable file, which Rusichi produced by overwork. Other Horde people check the goods in the lists and load them into the wagon. In the left corner of the picture before the audience appear young people – slaves. The artist deliberately draws attention to them and brings them to the fore. They are forced to kneel before the invaders, as they are faced with the impossibility of resistance and helplessness in front of them. The slave hands are tied behind coarse ropes. Baskak accompany the Horde wars. They are ready to kill anyone who is not able to contribute to their treasury. In the picture they are depicted in the dark mass in the background. Ivanov’s canvas “Baskaki” was innovative in the art of the beginning of the last century. He was able to portray all the drama and scene with the unusual, conspicuous, color design of the composition, as well as conciseness in each stroke.